This thought has been bouncing around in my head for years and I have spelled it out many times in person to friends and potters in the past but I think it's time to write it down. 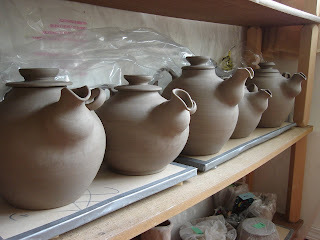 I have noticed that a lot of potters quit the biz. This is mostly because they have actually died of starvation but some have found that their bodies cannot withstand the work. Micheal Cardew, in his book, Pioneer Potter, referred to it lovingly as "donkey work" that had to be done daily to get the mug into and out of the glaze load. If you don't kill anyone on the way home, after you have forgotten that your stopping distance is now twice as far, you then have to unload that same thousand pounds once you get there. I received a wonderful gift from a retired potter of three clay carts that are VERY sturdy, her husband built them for her and then suddenly passed away. She was so very generous towards me, giving me all her old clay and carts and a few squidgy glazes (that I enjoyed trying out but they didn't fit my clay body on the microscopic level) it probably kept me in business in my second year because it meant that I made a few 60 litre batches of glaze without buying any raw materials. The clay had sat for many years before it was passed down to me so it was too hard to throw and I don't own a pug mill, so I donated it to the Camosun College pottery in Victoria. Anyway, if you get it unloaded and then spend hours weighing, wedging, balling, throwing and trimming it all and then carry it on ware boards to and from the kiln and wax and glaze and reload the kiln, you might find some sore tendons and ligaments. The theory is that if the thing you do all day is the hardest thing you do, it will eventually ruin your body. Hear me out. You all watched the olympics and saw at least one movement of the athletes that you thought would have killed you, perhaps it was the skiing crashes. I know I saw a few things that made me tense up. The fact is that these people have trained all parts of their body to accept this type of abuse so that a single run down the mountain is not too much strain on the body. Now back to the potter (or regular person) if my wrists are working as hard as they have ever worked when I am wedging the clay then they are spending hours at a time maxed out leading to damage! Lets say that I took up tennis and had sore tendons from the first few lessons, the way to fix it is to take a little break and then try again, no one ever got stronger by doing nothing. Somehow people feel like decreasing their activity level will help with pain but the opposite is true! When I started running my hip hurt quite a lot and I rested and strengthened the area with complimentary (glut. med/min) exercise then went back out running and to my surprise the whole hip had gotten stronger! The same effect was found in my knees that has caused me pain for the last few years on the bike. I would haul my pottery up sherman road with the bike and trailer and painful knees were an added bonus. Now when I run (8-10km) I am tired and a little sore but it is a normal acceptable level of tiredness in relation to the distance. We need to stress our bodies to be able to be relaxed during the normal work day. This means all sorts of stress the most important of which is our hearts. When I was a firefighter I quickly learned that the normal work day could be spent washing the truck or polishing the tools in the toolbox or fighting a fire, bottle after bottle until I fell over. This is an extreme example but it meant that I would have to spend a few hours every week with my heart (and whole body)working as hard as it would during a fire, to avoid serious heart damage when the next fire occurred. Bring this to your normal life and a potter who pushes on clay all day, lots of force and repetitive movement away from the body, only lasts a few years but if you do the opposite, say chin ups or rowing, it would build tolerance for the daily stress of work and even out the joint and muscle support. I met a potter last week who has been potting for 35 years and does yoga with lots of static strength on a weekly basis, this has likely provided years of pain free, or at least reduced pain, potting that would have been unbearable without it. While you are at work, whatever that looks like, there should be some level of comfort in your body, if you care for your body it will care for you. If you push all day, pull in your own time, if you walk all day, try swimming or cycling after work. Do whatever you can to stress your body so that the stress of work is not damaging. Just my thoughts.